Does a Horizontal Leg Tank really need Hoops or Bands? 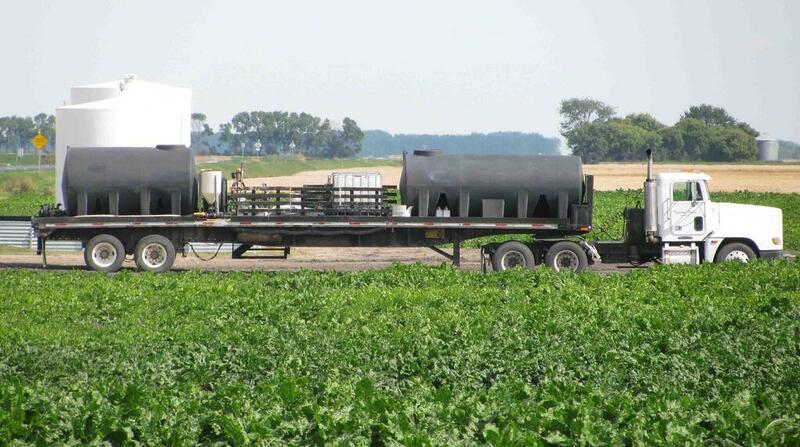 A horizontal leg tank is used primarily for transporting liquids from one location to another. These liquid types include fertilizer, salt brine, water and livestock feed. Some of these liquids can be considerably heavy, due to the material that they contain. That's why a proper mounting system is critical for your safety. We get this question a lot. So, I did a some interesting research to find out what the real facts are. I felt it's time to write this article so everyone can see the answer. You may think that every horizontal leg tank is the same. This is not the case. Horizontal leg tanks mounted with hoops and bands - These types of tanks originated first and have been the only option on the market for years. However, these tanks have some concerns that you may not know about. To show you what I mean, I thought it would be best to share an in-depth study that was conducted by Purdue University. Here is what they said. "Metal straps or tubular hoops that run across the top and down the sides of the tank to anchor it and support the sidewalls require tightening, but always be careful not to over-tighten them. Over-tightening prevents poly tank walls from expanding adequately when filled. That is, when the tank fills, the sides push outward; and if the straps or hoops are attached too tightly, the tank becomes deformed — and weakened — at the point of contact." After reading this, it is clear that horizontal leg tanks with hoops and bands require a lot of unneeded maintenance. I have included a link to the entire research study here. Horizontal leg tanks mounted with pins - These type of tanks are becoming a lot more popular as people discover their benefits. The main difference between these leg tanks and the other horizontal tanks is the way they are mounted to the truck bed. Instead of using the risk of hoops and bands, they are mounted with pins through each leg. This is a lot safer as it allow the tank to be mounted with double the amount of mounting points. Although this is may seem like a newer idea, these tanks have been used around the world for over 10 years. In all types of industries, they have been proving themselves to be a lot more maintenance free. There is no wear points on these horizontal leg tanks and no need to tighten bands and hoops after filling. This is a very clever feature that has become obvious, causing everyone to reconsider the costs of choosing leg tanks with bands and hoops. So do Horizontal Leg Tanks really need Hoops or Bands? After talking to customers that own horizontal leg tanks with hoops and bands, it seems that one thing that really annoys them is, having to tighten their hoops and bands after filling. When the tank is emptied, the tank shrinks back to its original shape causing the bands to come loose again. To prove this, these tanks include the sticker below. This is not necessary with a horizontal leg tank mounted with pins. When a horizontal leg tank is being used, one of the biggest stress points is where the tank is connected to the truck bed. The pin mount system is a new way of mounting your tank safely. To help explain this, here is a link to a blog I wrote a while ago that has helped a lot of our customers.